Use Microsoft Outlook Reply With Template add-in to create your own Email Reply Template. Create Outlook email Template in Microsoft Outlook Reply With Template software. Just Copy-Paste or Drag-and-Drop an email message from any Microsoft Outlook folder to the Reply With Template folder. This message will be automatically recognized as a template and will be accessible from the Select Template form. You can edit and customize your reply templates. Go to Outlook Reply With Template folder and select Create template option from the Outlook toolbar action menu, or right click on any selected email message. Please note, that if the Subject field is blank, the Subject will be set as Untitled automatically. In case if the address fields are specified, you can choose to save the address fields values for this template. You can easily create outlook email template from any existing email. You just have to select an email and choose Save as template option from the template action menu. Create new email messages out of email reply template in Microsoft Outlook. There are several ways to create a new email from your existing templates. Right click on any selected email reply template from the Reply With Template folder and select New e-mail from template option. 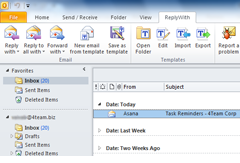 Select one or more Outlook Contacts, and choose New e-mail from template option from the right-click menu. In the Select Template form you can enable the Send separately to each recipient option or send the same message to all the recipients. Open the selected template in Reply With template folder. A new email message created from selected template will be opened.